When you stay at The Caravelle Resort in Myrtle Beach, you'll be on the beach, within a 10-minute drive of Ripley's Aquarium and The Carolina Opry. 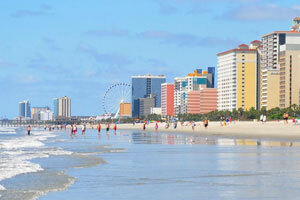 This beach hotel is 5 mi (8 km) from Broadway at the Beach and 5 mi (8.1 km) from SkyWheel Myrtle Beach. Make yourself at home in one of the 620 air-conditioned rooms featuring refrigerators and microwaves. Rooms have private balconies. Flat-screen televisions are provided for your entertainment. Private bathrooms have complimentary toiletries and hair dryers. Dip into one of the 3 spa tubs or enjoy other recreational amenities including a lazy river and a fitness center. Additional features at this hotel include complimentary wireless Internet access, an arcade/game room, and gift shops/newsstands. Enjoy a meal at the restaurant or snacks in the hotel's coffee shop/café. Relax with a refreshing drink from the poolside bar or one of the 2 bars/lounges. Buffet breakfasts are served on weekdays from 6 AM to 10 AM and on weekends from 6 AM to 11 AM for a fee. The preferred airport for The Caravelle Resort is Myrtle Beach, SC (MYR).